I'm off recovering from eggnog, picking ribbon out of my hair, or just taking it easy. In other words, this review was pre-written. Enjoy! 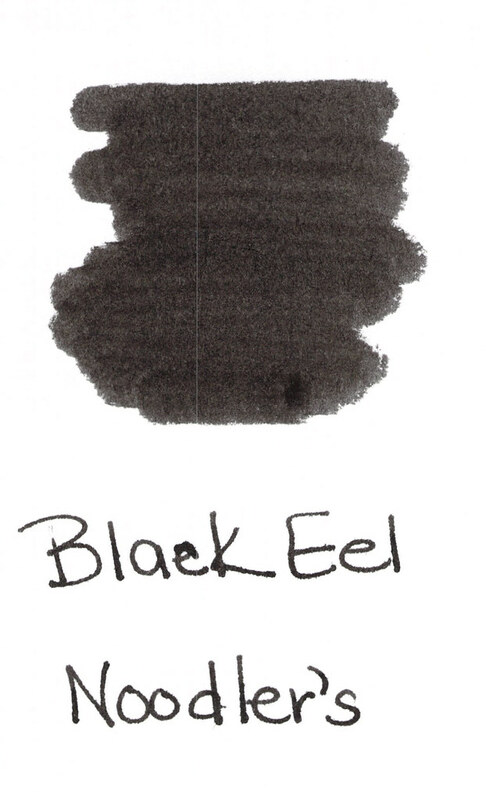 How is this different from Noodler's Black? Well, I didn't know. And I wanted to know. So I did some research before this review. But first, what the heck is that line down the center of the ink swab? Yeah, I don't know. It's not on the swab. I think it's gunk in the scanner. I hope it's not too distracting. I hope my mess-up on the "c" in "Black" isn't too distracting, either. I'm sorry, ok? That's what I'm trying to say. 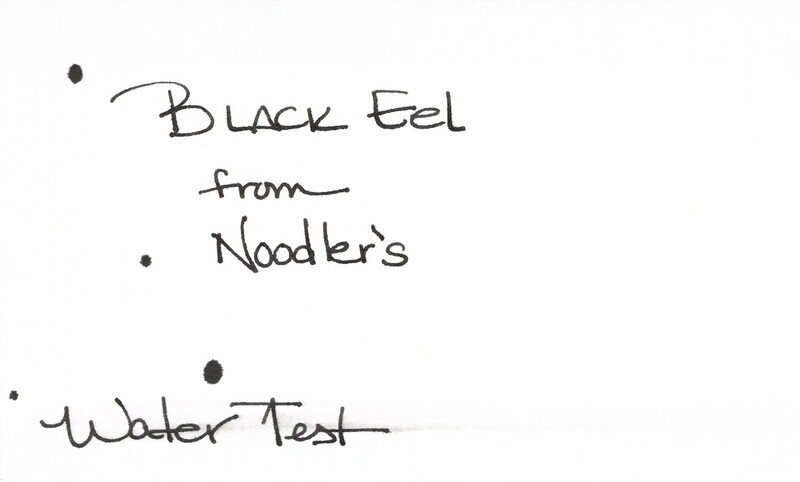 Inks in the Noodler's Eel series are lubricated (stop being gross). Rumor is that this lubrication helps the action of piston converter pens (the ones you twisty up and down to fill). Then I read things that say that the difference isn't appreciable. Then I read things that say the ink is "sticky," and takes a long time to dry. And then I read things that contradict all of the above. My general thought - ymmv, yo. There are so many variables with inks and pens and papers and your writing style. Your mileage may vary, yo. It's pretty. The cost is the same as other Noodler's inks. It's very well-saturated and I like that. A little smearing, but not horrible. Felt wet to me in my pretty Libelle. I liked it. Very little feathering. No shading. Solid. So. That's Black Eel. Will you give it a go? I may end up getting bottle of this to see if it makes any difference in pens that I've had trouble with. 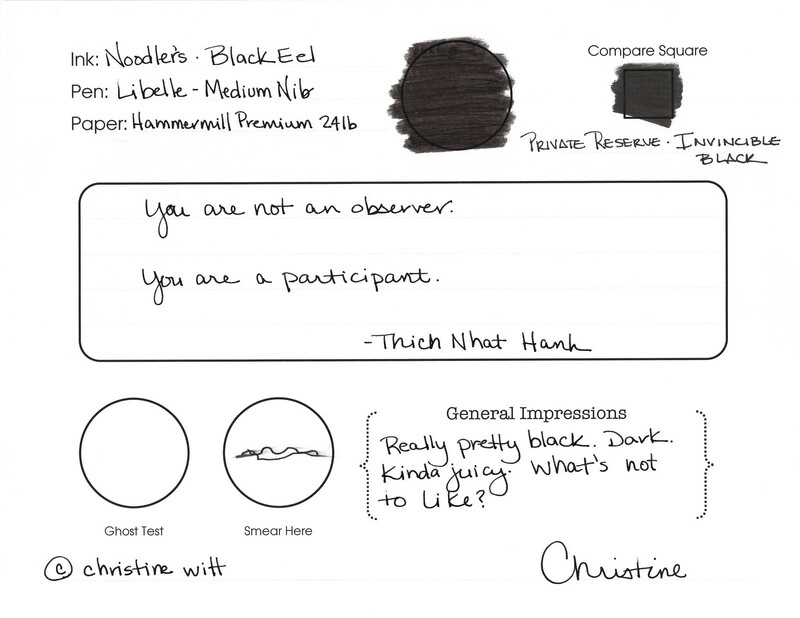 Here's what some of the kind people over at Fountain Pen Network had to say about this one.